Then, it’s time to walk. Barcelona is my favorite walking city in the world. The architecture, old doors and windows are stunning, especially in the Eixample, Gràcia, and Barri Gòtic neighborhoods. I’ll probably walk for 2 hours and take some pictures for my blog. After picture-taking, I’ll head over to the Born for a snack. 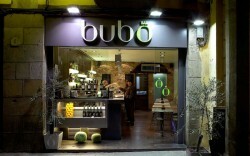 I might stop off at Bubó for a quick glass of cava and 2 of their mushroom croquetas. If you love mushrooms, these are the croquetas for you. Or, if I’m in a cheese tasting mood, I’ll head over to Formatgeria La Seu on Carrer de Dagueria where the delightful owner offers some outstanding cheeses. Or, I might stop in at El Xampanyet (c/ Montcada, 22) for 1 or 2 tapas. Since this is an exercise day, I’ll walk over to Montjuïc to the Fundació Joan Miró. Montjuïc is spectacular. I’ll backtrack a little to get there, as I love coming up to Montjuïc from Plaça d’Espanya. 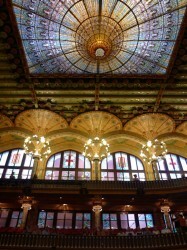 The Museu Nacional d’Art de Catalunya building is a marvel. The gardens and views along the way are magnificent as I meander toward the Fundació. Miró is my favorite artist and the Fundació offers a great exhibition of his work that spans from his earliest paintings to his later years. After an hour or so there, I’ll head back to my neighborhood for a late and lighter lunch at my favorite café – Cornelia & Co (c/ València, 255). I love this café as it has a nice variety on its menu, from salads and lighter plates to some excellent pastas and hamburgers. The setting inside is fabulous. 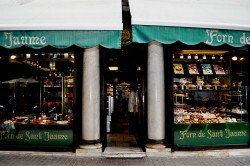 You can browse their wine selection or sweets for sale, as well as their deli section. The interior is charming and the staff is always nice. I’ll probably get the goat cheese salad with honey and walnut vinaigrette or the grilled vegetables with romesco, with a side of pan con tomate. I love their pan con tomate. They give you a huge chunk of grilled, rustic bread, a clove of fresh garlic, a small pot of lovely olive oil, salt, and a fresh tomato. You get to make it how you like it. Even though I’m suppose to be eating light for lunch, I might indulge in a piece of carrot cake. It reminds me of home. During a siesta back at my place, I’ll look for some music playing around town. August is a particularly great month, as the jazz festival goes on, as well as “30 minutes of music” at different venues around town like the Palau de la Música. Also, throughout the summer through the end of September at Casa Batlló they offer what are called “Magic Nights” of music in the courtyard at Casa Batlló. I’ll pick one of those to see/hear after dinner. At around 7:00 or 7:30 pm, if I’m feeling like a bit of wine, I’ll head over to Monvínic (c/ Diputació, 249), which is a wine tasting bar in my neighbourhood. It’s very classy, it has cool, modern décor and they hand you a tablet on which you scroll through the wines. They also have a very large wine library right in the bar area. You can ask for taster pours, so you don’t have to have full glasses and this is the way to go, both economically and so you can taste more than one. At 8:00 or 8:30 pm, I’ll make my way to dinner. If I’m feeling like a super decadent day, I’ll have the 8-10 course tasting menu at Alkimia (c/ Indústria, 79), which I think is the best restaurant in Barcelona, hands down. 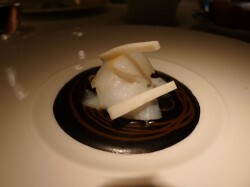 It’s one of the few with 1 Michelin star that I think is totally deserving of their star, and maybe even 2 stars. If I’m feeling like I need to eat a little lighter (not so many courses), yet still gourmet, I’ll go for the great vegetarian food that even non-vegetarians rave about at Restaurante Sésamo (c/ Sant Antoni Abat, 52). Rachel is a lawyer turned chef who did 3 stages in restaurants in Barcelona. 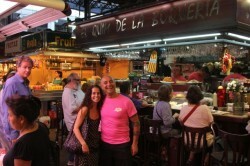 She has blogged about her career change and continues to blog about the food and sites of Catalonia at saltyapron.com.